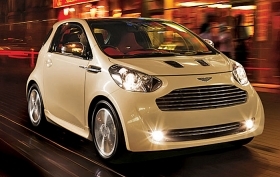 Aston Martin said it hopes to extend market availability by 2012 to other countries including the U.S. It will offer buyers a choice of standard manual or optional CVT automated transmission. Inside the vehicle will have keyless entry and start, heated seats, satellite navigation and a full leather interior. Launch editions will include a bespoke Bill Amberg five-piece luggage set, especially designed for the Cygnet, said the statement. The Cygnet will be the eighth major production car Aston Martin has built at its Gaydon plant since 2004, and will be assembled in a new facility by the same workforce that build Aston Martin's other cars, the company says. Just a little larger than the Smart ForTwo, the Cygnet is a major departure from the automaker's usual big, high-performance sports cars. Last year, the company said it hoped to sell around 3,000 Cygnets a year worldwide.